KATHMANDU: The National Development Council (NDC) meeting has endorsed the approach paper of 15th National Plan and a long-term vision paper with various 'ambitious' targets like achieving 10.2 percent economic growth and raising per capita income to $1,600 by the end of the five-year plan, among others. The 15th National Plan starts from the fiscal year 2019/20 and will last until FY2023/24. It envisages 9.6 percent of average annual economic growth with an estimated public expenditure of Rs 9.96 trillion over the five years. Following the two-day consultations and discussions over six thematic issues on the approach paper and long-term vision paper among 300 participants, the meeting decided to approve the draft of the approach paper after incorporating 'necessary' suggestions of the participants. Chaired by the Prime Minister, NDC is the apex body of the government to hold discussions on development issues. Cabinet ministers, chief ministers of provinces, chairs of federal parliamentary committees, vice chairpersons of provincial planning commissions, and representatives of local units as well as private sector are members in the council. Puspa Raj Kadel, the vice chairman of the National Planning Commission, said that the periodic plan will come into implementation after it is endorsed by the board meeting of the commission and the cabinet meeting. 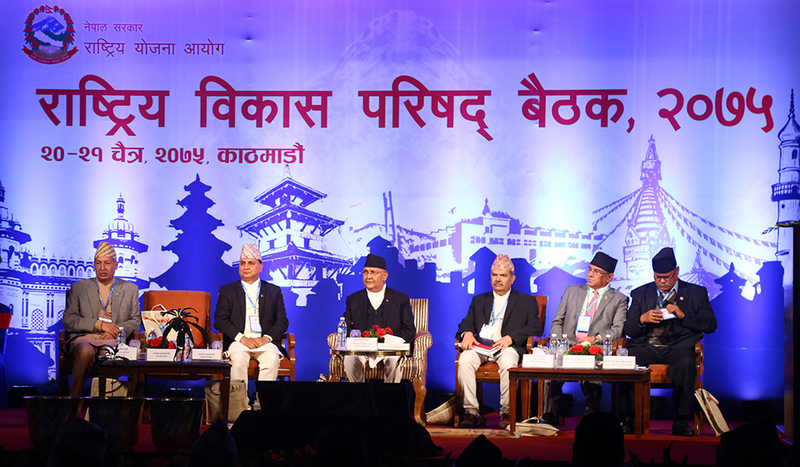 Addressing the closing ceremony of the meeting, Prime Minister KP Sharma Oli said that the upcoming 15th plan would be different from the previous periodic plans, claiming that it will transform the country's identity. “This is not a regular periodic plan. This is being implemented in the changed context. This is the first periodic plan after the implementation of the federalism,” said Oli. “This plan will bring a change in the country. We are omitting 'L' from the LDC status of the country within this period,” he said referring to the status of 'least developing country'. While the country will still not become a developed country within this period, he said that policy will create a foundation for that. Also speaking in the closing ceremony, Finance Minister Yuba Raj Khatiwada vowed to align the budget and policy and program for the upcoming FY 2019/20 with the periodic plan. Pointing out a challenge of finding financial resources to implement the periodic plan and achieve the set targets, he underlined the need to increase gross domestic savings to mobilize internal funds. He also indicated the federal government's huge financial liability as a constraint in mobilizing additional financial resources. According to Khatiwada, the federal government is sitting against the annual liability of Rs 600 billion including the pension cost and national pride projects, among other mandatory expenditures. “When the economic growth goes up, the capacity of savings also grows. We have to increase the gross domestic savings to create a foundation for the self-reliant economy,” said Finance Minister Khatiwada. He also said that the government will rope in private sector to implement the periodic plan. “In areas where private sector is capable, we will let them do it,” he said, adding that the government plans to mobilize the resources in a way that will eventually end the dependence of foreign support at some point, at least on foreign grant assistance. The periodic plan, among others, targets to reduce absolute poverty rate to 13 percent by FY2023/24 from 18.7 percent in the current fiscal year and unemployment rate to six percent from 11.4 percent.